Indigo has a long global history and is one of the most ancient dyes we know of. Blue has long been a beloved color of many people and indigo’s global popularity is not surprising. Indigo is a plant, that lacking any blue in it’s outward appearance has long been cultivated for its blue dye. Blue dyed cloth has been found in Egypt dating back to 2500 BCE. (Pettit, 28). It is important to note that indigo was not the only blue dye used in the ancient world. Indigo grows in the tropical and subtropical regions of Asia, Africa and the Americas, whereas woad, whose dye color is quite similar to indigo, grows in more temperate climates. The two most common types of indigo are Indigofera tinctoria which is native to India and Africa and Indigofera anil, native to Central America and South America. Indigo was cultivated by many different cultures in the ancient world and each culture and region has their own history and practices surrounding indigo dyeing. In Europe however, woad was the primary blue dye until Vasco de Gama’s explorations helped open a sea trade route with India in 1498 indigo dye became more common in Europe. By 1615 indigo had become a valuable commodity in the European market, so much so that by 1737 indigo was demonized by prosperous woad growers defending of their industry. Indigo’s cross cultural popularity is evident through storytelling and language: In English, French, German, Danish, Swedish and Russian the name is indigo. India, Thailand, Laos, Japan, China, Nigeria, Senegal and Mali are just a few of the countries that have traditions of indigo dying. Stories and legends of the dye and its enchanting quality abound throughout the world. In Liberia there is a legend specifically about the creation of indigo. Asi, a seer from a village sets out with her baby on a spiritual journey. After becoming drunk on pieces of sky she covets the color blue. When she awakens her baby has died, as a punishment for her selfish thoughts in a holy place. Where the baby has wet itself, its white lappa (diaper) was blue. A water spirit comes to the woman and tells her that the blue comes from the leaves she had gathered as a cousin for her baby, the ashes of her grief, the salt of her tears and her baby’s urine. The spirit goes on to say that now that the earth had indigo it is the duty of women too old to bear children to take on the sacred duty of tending the indigo pots. (Polakoff, 221-224). Once you experience the process of indigo dying the magic quickly becomes apparent as its color changes right before your eyes. This magic is actually chemistry and it is this chemistry that differentiates indigo from other dyes. We are typically used to seeing dye baths whose color is similar the the final color we see in the fibers we are dying. Indigo dye baths appear to be bright yellow-green with a dark, coppery skin across the surface. Once you pull your fibers from your dye bath your fabric will change colors right before your eyes! This transformation is the culmination of a multi-stage chemical reaction. 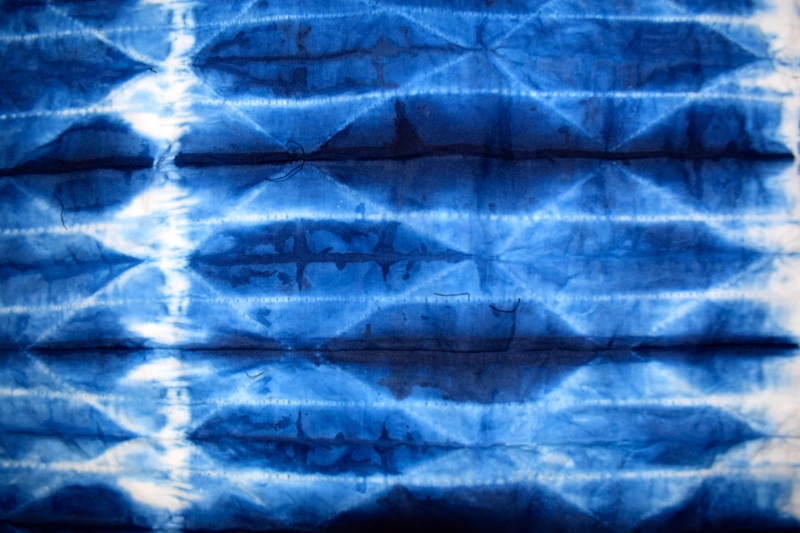 Indigo dye, which comes as a blue powder, is already oxidized, meaning the molecule is already attached to oxygen. Added to water, the dye stays blue, but once you add thiox (thiourea dioxide), the water transforms than almost neon green. This happens because thiox grabs on to that oxygen and indigo loses its blue. Exposing the dye bath to oxygen will turn these indigo molecules blue once more. This is why we can witness the dye changing from a yellow-green to a potent blue. This is also the reason you have to be careful and avoid introducing oxygen from the air to the dye bath. Once indigo has oxidized it will not dye fibers and the chemistry of the dye bath must be remeasured. Another quality of indigo that is different from most dyes, is how it actually adheres to fibers. Indigo does not bond with fiber rather it penetrates them and sits within their structure. As the indigo oxidizes the molecules expand and wedge themselves into their stations. Because of this indigo dye can “crock”, slowly flexing and rubbing off of the fibers over time as they are handled (Carrie Sundra). From start to finish indigo has an almost life-like quality to it and it is easy to see how the dye process could take room in ancient sacred spaces and practices. Dying with indigo is different than other dying processes and careful preparation combined with an understanding of each step will be incredibly helpful. Indigo dye, even in its powdered for, comes from a plant. In some ways it is very similar to live bacterial cultures or yeasts, with the correct handling it can be manipulated into wonderful configurations. Similarly, indigo can be effected by things like temperature and exposure to oxygen. Just like you would not want to overheat yeast at the risk of killing it, you also need to avoid overheating your indigo as it will also “die”. The ideal temperature for an indigo dye vat is 85º F to 110º F. Using a cooking thermometer can help you attain this temperature at home. Ideally you would be able to maintain that temperature evenly though a bucket warmer or other water heating device. Most of us don’t have such a device at home so keeping your indigo dye vat in a relatively warm part of your house with stable temperatures is the best at home option. As with any dye you will want to test the dye on a spare piece of the fabric or fibers you are planning to dye. Indigo works best with natural fibers such as wool, cotton, hemp, linen or silk. The color intensifies with multiple rounds in the dye bath so make sure to dip your test strip as many times and for the length of time you plan to dip your final piece. Many variables can influence the final product so keeping things consistent is important. Take notes of your times, measurements, temperatures, etc. to increase your accuracy and for future reference. 1) Set up a work space for yourself, the dye vat can be heavy once it is full of liquid so try to set up somewhere the vat can remain until you are done with it. Lay down a plastic tarp, trash bags or other plastic sheeting to prevent the dye from making contact with the surface below. I like to cover the plastic with a layer of brown construction paper to help soak of spills and drips. 2) You will also need a large bucket with a lid, I used a 5 gallon bucket but you might want to use something larger depending on how much fiber you are dying. Rubber gloves, more than one pair or a sturdy pair of reusable gloves. A long spoon or stir stick, long enough to reach the bottom of your vat and made go nonreactive material such as wood or enamel coated steel. A small container to store the “flower” in while dying, a drying rack or surface for placing your fabric while it oxidizes. 3) Important note: Never use tools for food preparation that have been used for dying. Keep these things separate! 1) Fill your 5 gallon bucket with 4 gallons of warm water (85º F). Using filtered water is best to avoid any unwanted reaction with minerals or chemicals that might be in your tap water. I used cold filtered water from my sink and balanced that out with filtered water that I boiled in a kettle. Remember that as your vat sits it will cool down (unless you have a submersible heater with temperature controls) so you might want to start with you water at a slightly higher temperature. I started with 85ºF water. I think it did cool down a little though as there wasn’t much flower development on the surface of my vat. 2) Measure 20 Grams of Powdered Indigo dye into the warm water. Some direction for this step call for dissolving the dye in a small amount of water and adding that to your larger vat. Either option seems to work with these quantities but if you are working with a larger vat consider dissolving your dye in a smaller container for easier handling. Stir gently with your stir stick. Don’t create bubble or mix too vigorously, you want to mix in as little air as possible as indigo oxidizes. 3) Next measure 100 Grams of Soda Ash (Sodium Carbonate). You can mix the Soda Ash with warm water in a separate vessel or add it directly to your vat. Again, mixing it separately will be helpful when working in larger quantities but I did not find it necessary for these particular amounts. While slowly and gently stirring the vat add the Soda Ash to your dye bath. The addition of Soda Ash raises the PH of your dyebath and helps prepare for reducing the indigo dye and making it soluble in water. Stir the Soda Ash in thoroughly but carefully. 4) Now measure 50 Grams of Thiox (Thiourea Dioxide) and add it slowly to your vat. The Thiox acts as a reducing agent and aids in the process of oxidization necessary for indigo dye to transform from it’s initial state of yellow-green to the classic blue we are familiar with. Stir thoroughly but not vigorously, slowly reverse direction making sure to scrape the edge and bottom of the vat before removing your stir stick. Slow and cautious mixing is needed to prevent exposure to air which will oxidize the dye. 5) Cover your vat with a lid and allow the vat to settle for an hour. Once the vat has settled you will see a layer of foam on the top of the liquid. This is called the Flower or the Bloom. Very gently push the bloom to the side and check the color of your dye bath. The liquid should be a bright though translucent yellow-green, almost like antifreeze. The vat of liquid will have a darker, almost copper toned slick across the top. If the color doesn’t look right wait another 15 minutes and check again. Things like ambient temperature can affect the dye bath’s development. 1) Choose the fabric or garment you wish to dye, keeping in mind that natural fibers are best for dying with indigo. 2) There are a number of ways you can manipulate your fabric depending on your desired effect. Some of these include wax resist also known as batik and Shibori, a Japanese technique involving twisting, binding, stitching or folding fabric to create areas where the dye can not penetrate. 3) After you have prepared your fabric with your preferred technique, soak the fabric thoroughly in warm water. 4) Remove the lid from your vat and, wearing rubber gloves, skim the flower or bloom from the top of your vat. Place this aside in a small container, you will return it to your vat later. 5) Squeeze the excess water from your fabric and slowly submerge your fiber into the dye bath. Gently squeeze and work your fabric under the surface to help ensure that the dye penetrates your fabric evenly in the unbound/unwaxed parts. Try not to disturb the surface or stir your vat too much as to avoid oxidizing your indigo vat. Do not drop your fabric into the vat or allow it to rest on the bottom. There will be sediment that has settled on the bottom of your vat that can leave spots or discoloration on your fabric. You can make a suspension rig by crossing the top of your vat with a board or dowel and tying a piece of string that allows your fabric to hang freely in your vat. It is important to remember that how you attach this to your fabric will affect the pattern or texture left on your fabric. 6) Leave your fabric in for the desired length of time. Making some test strips beforehand and be helpful in determining how long you want to leave your fabric in the dye bath, or you can just go for it and see what happens! Indigo will look significantly darker when it is wet so give your fibers time to dry before deciding if you like the final color. You can dip the same fabric multiple times for a darker and darker color. 7) When you are ready to take your fabric out of your dye vat give it a squeeze just below the surface as you pull it out. You want to avoid agitation and splashing as much as possible so you don’t introduce more oxygen to your vat. As you remove your fabric from the dye bath this is where the magic of indigo dyeing happens! Your fabric will emerge from the vat the same bright yellow-green as the liquid it was submerged in, but slowly, as it oxidizes, it will turn blue. 1) Set your fabric aside and let it oxidize completely. This can take anywhere from 10 minutes to half an hour depending on the thickness of your fabric and the manner in which you have manipulated it prior to dying. 2) At this point you can dip your fabric again to achieve a darker color. You can also undo whatever notting or tying you may have done and retie your fabric to create another layer of pattern. Once your fabric is dry you can also add another layer of resist if you wish to add more detail and layers of tonality to your piece. 3) When you are finished dying, rinse your fabric in warm water and a mild detergent. Keep in mind that the dye will be darker while it is wet even once you’ve rinsed it thoroughly. 4) If you are completely done with your dying session carefully return the flower/bloom that you set aside earlier, to the vat. Place it gently on the surface and stir the vat as before in a circular fashion. Reverse direction to center the flower. 5) Put the lid back on your vat and allow it to settle for at least an hour before dying again. Your vat should keep for several days and you will be able to dye multiple times. While researching indigo dying I had the pleasure of meeting local Portland artist Sarah E. Laird. Sarah shared some of her thoughts on indigo dying. Her work can be seen in her online gallery at sarahelaird.com or through her online and brick and mortar studio and shop, Studio One O Eight. Sarah E. Laird November 20, 2016 I graduated from Oregon College of Art and Craft (OCAC) with a focus in fibers. This is where I was introduced to and fell in love with dyeing and surface design. My work combines traditional Japanese shibori methods with a modern exploration of color. When I was at OCAC, I helped maintain a live indigo vat but I have not raised my own plants. It takes time and dedication to keep a vat active over time. It’s a delicate balance of heat, ph and materials that keep it alive like a living culture. The most challenging thing about indigo is that the vat can be exhausted by the addition of too much oxygen or by overuse. Indigo has a distinctive earthy smell that really sticks in my mind. The magic of indigo grabbed me right away. The first time I dipped cloth into the indigo vat and watched the color change from green to deep blue when exposed to air, I was hooked. When I work with this distinctive color, I feel connected to a long line of makers who have been using this dye for centuries. 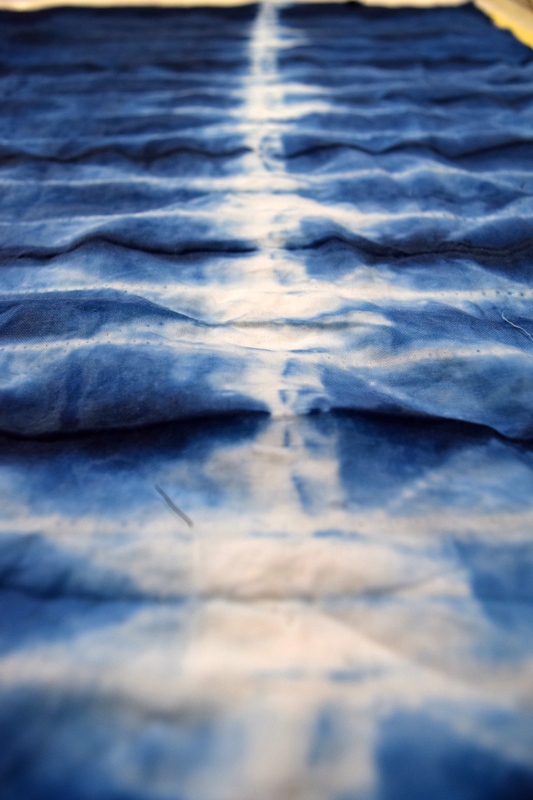 I am most interested in the Japanese traditions of using indigo with shibori techniques. I am fascinated by the technical precision that can be obtained by folding, stitching or otherwise manipulating the fabric to create texture and design. I am continually interested in combining various shibori techniques to create patterns on cloth. Recent pieces include quilting and hand sewing. I also have a line of hand dyed apparel and accessories under Studio One O Eight. Folded, stitched and tied shibori techniques. This is the scarf I was dying in the video. You can really see a nice range of the depth of the color indigo can produce. An interesting note is that the edge I held open in the video is one of the diamonds in the center column of the wider center column. You can see where the more open and exposed edges were by how much darker the color is in those spots. The indigo might have penetrated the whole scarf but I washed it before opening it so only the oxidized dye remained. Folded and block wrapped t shirt. The color became much lighter after the shirt dried. Rewrapped it and gave dipped it a second time in the dye bath. I think I will continue to layer the shirt with dye and patterns. Adrosko, Rita J., Natural Dyes In The Americas. Wasshington D.C.:Smithsonian Institute Press, 1968. Print. “Growing and Processing Indigo.” YouTube, uploaded by Sarah Bellos, 29 Mar. 2012, www.youtube.com/watch?v=g8EOTa94ie8. 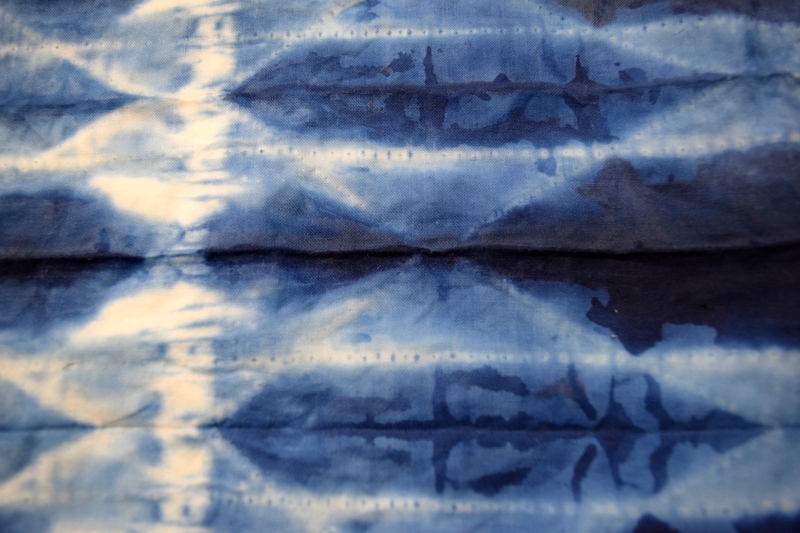 Accessed 18 Nov.
“How to Dye With Natural Indigo.” Dharma Trading Company, ND. http://www.dharmatrading.com/information/how-to-dye.html. Accessed 18 Nov. 2016. Laird, Sarah E. Personal interview. 20 Nov. 2016. Pettit, Florence Harvey. America’s Indigo Blues; Resist-printed and Dyed Textiles of the Eighteenth Century. New York: Hastings House, 1974. Print. Polakoff, Claire. Into Indigo : African Textiles and Dyeing Techniques. 1st Ed., Anchor Books ed. Garden City, N.Y.: Anchor/Doubleday, 1980. Print. Recker, Keith. “Get Blue at Home: Do It Yourself Indigo.” Handeye Magazine, 31 May 2009, http://handeyemagazine.com/content/get-blue-home-do-it-yourself-indigo. Accessed 20 Nov. 2016. Sundra, Carrie. “Indigo Dying, Full Video.”YouTube, uploaded by alpenglowyarn, 27 Jan. 2014, https://m.youtube.com/watch?v=eNyg6tUEbys. Accessed 20 Nov. 2016. Indigo dye bath ready for dying.